When it comes to downsizing, there are people divided at opposite ends of the spectrum. There are the hoarders who find it impossible to throw anything out. They wind up cramming a full house full of things into a much smaller space. The boxes never get unpacked, or worse, wind up in storage, never to be seen again. Then there are the clean-slaters. These are the people who like to start from scratch. They decide to update everything, following the latest trends and often find, a few years down the road, that maybe they shouldn’t have gotten rid of that lovely vintage table from Aunt Sally. Well, as it turns out, these are not the only two choices. 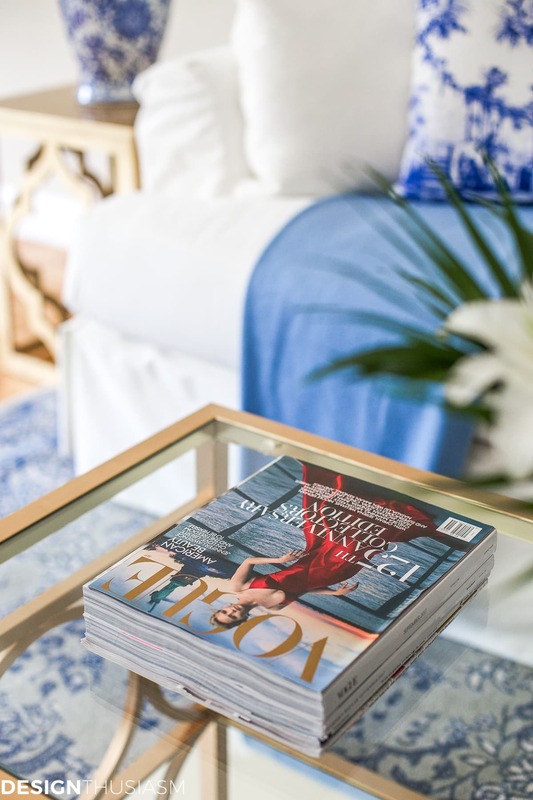 It is possible to decorate a new space with some updates, but stay firmly connected to your well-honed personal style. In fact, this is all the more so when decorating a second home. Perhaps you remember my post about my parents’ upcoming move into a new apartment. You can read about what led to the decision in THIS POST, where I also outlined the decor plan for the apartment. Well, today I have the living room reveal to share with you! My parents are well into their 80s with various health problems, not the least of which is my mom’s memory issues. I was told by countless people that a couple their age could not make a move; that if they did move, my mom would need to have everything familiar with her. But the truth is, with proper planning and an in depth knowledge of their taste and needs, the move turned out to be the best thing that could’ve happened. Here’s how I decorated their space to maintain their own familiar style, while still incorporating some modern conveniences. 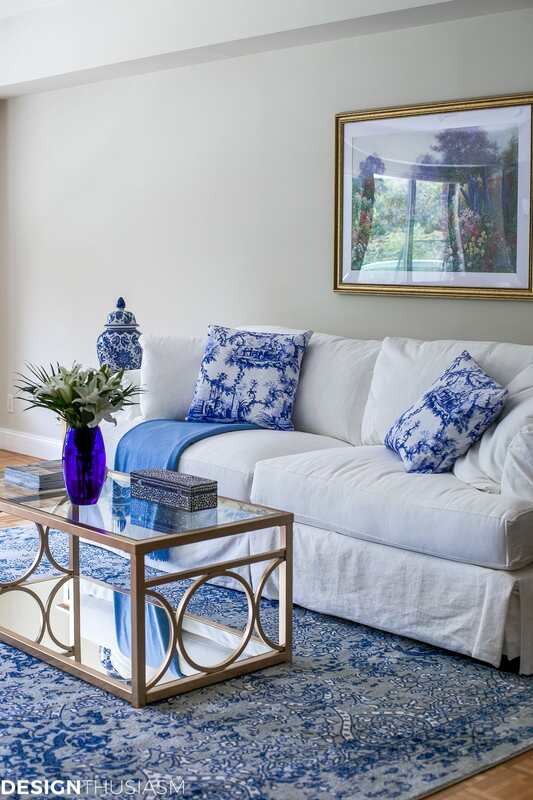 Most essential to their style is mom’s love for blue and white. Perhaps if her style had not been so pronounced, this would have been a lot more difficult. But reading her taste was easy and everything flowed from there. 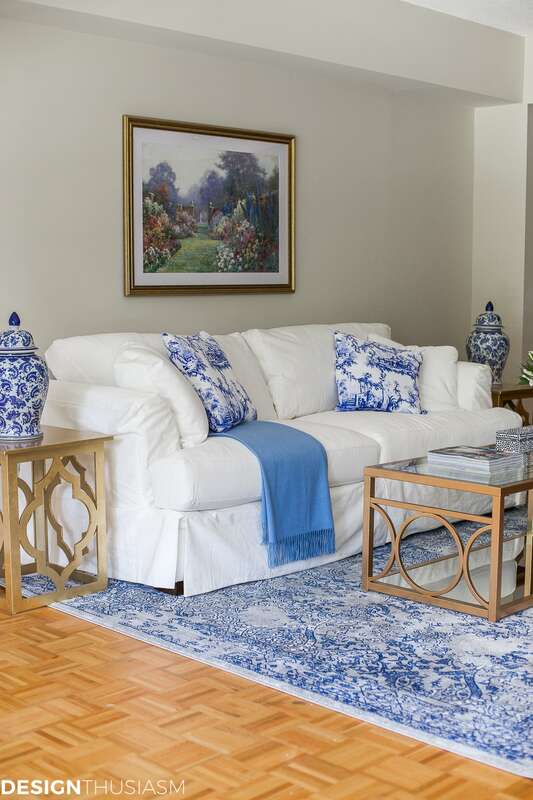 I began with a white slipcovered sofa, a piece that would peacefully co-exist with her beloved blue and white decor, but was a bit less buttoned-up than their typical tailored sofas. My mom comes from the tradition of not actually sitting on the sofa (yep, not joking!) and this casual plush piece is incredibly inviting. 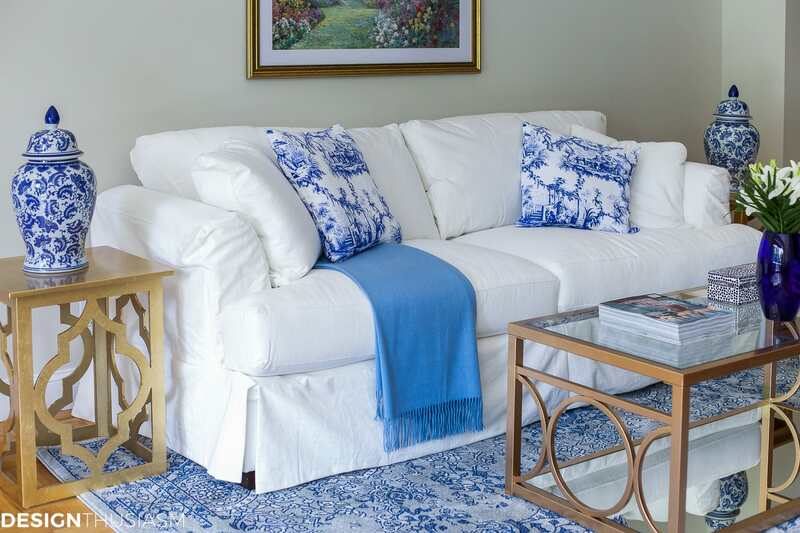 The slipcovers make the light color workable and the choice of a true white makes it possible to be bleached. Most of you well know about my passion for small pleasures and I made sure to include as many as possible. My parents come from a generation that didn’t routinely treat themselves to these little luxuries, so I made sure to pepper the apartment with bouquets of fresh flowers. My mom is not a big television fan and in fact, she rarely sits still. Yet she’s always loved fashion and I took advantage of the time of year and stacked the coffee table with a September issue or two. This has proven to be the one thing that engages her when she’s feeling displaced. The coffee table itself turned out to be a last minute project. I knew the brass and glass would fit her taste, but when the table came in, it was a really cheesy shade of brassy gold. I was crushed that it really was killing the look and so the day before my parents moved in, while the movers and workers were getting the apartment ready, I sat on the floor and painted the table. In the realm of modern conveniences, this is no doubt the largest TV my folks ever had. I’m crazy about the blue sideboard beneath it which made it easy for us to configure their new electronic toys. 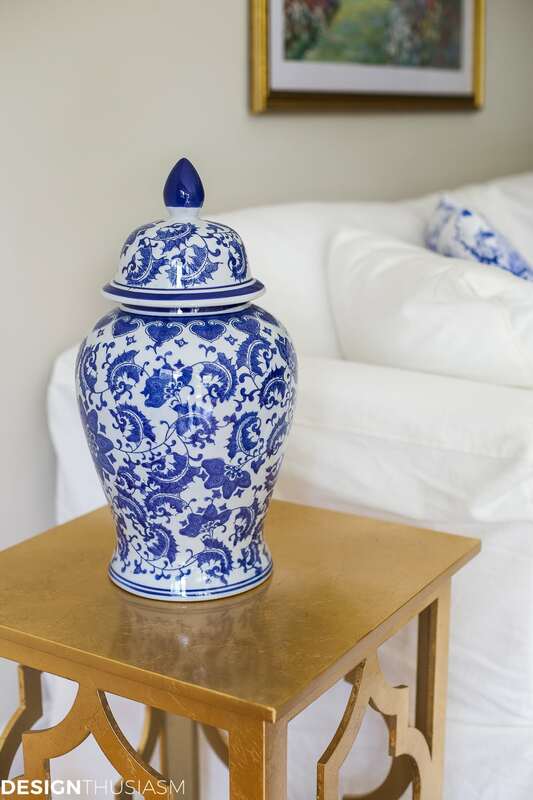 The decorative items that most make the apartment fit my parents style are the blue and white decorative items that can be added to any neutral room. 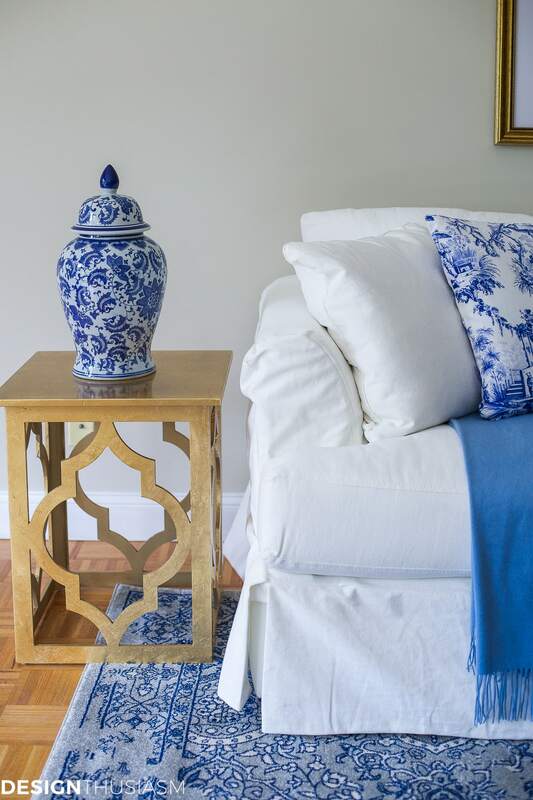 Chinoiserie ginger jars, toile pillows, patterned rug and a lovely blue wool throw were not terribly expensive and are style-defining in this space. The blanket is a must for elderly couples who are somehow cold even as the summer sun blazes outside. 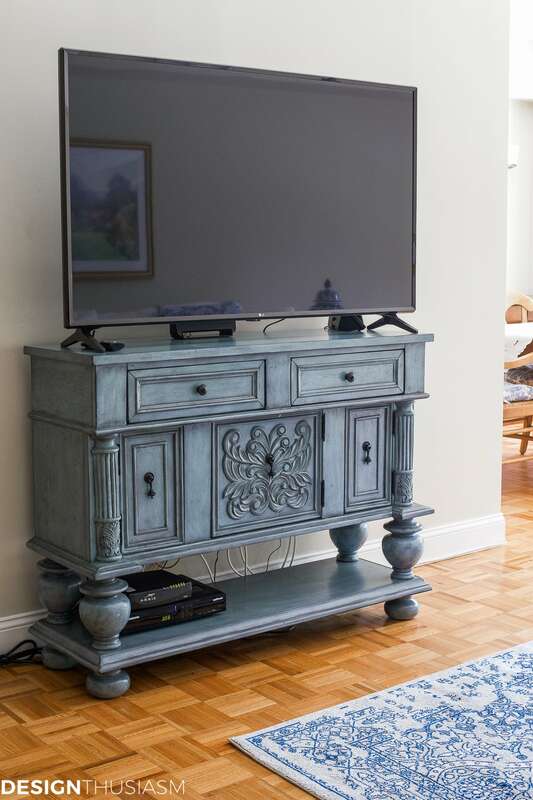 When downsizing, all things must serve a purpose and the pretty blue and white mosaic box secretly houses the television remotes. Because my parents were not selling their house yet, we bought mostly new furniture. I took pains, as such, to stay on a budget and you can find the sources at the bottom of this post. The gold tables add a bit of warmth to the light and bright decor around them. 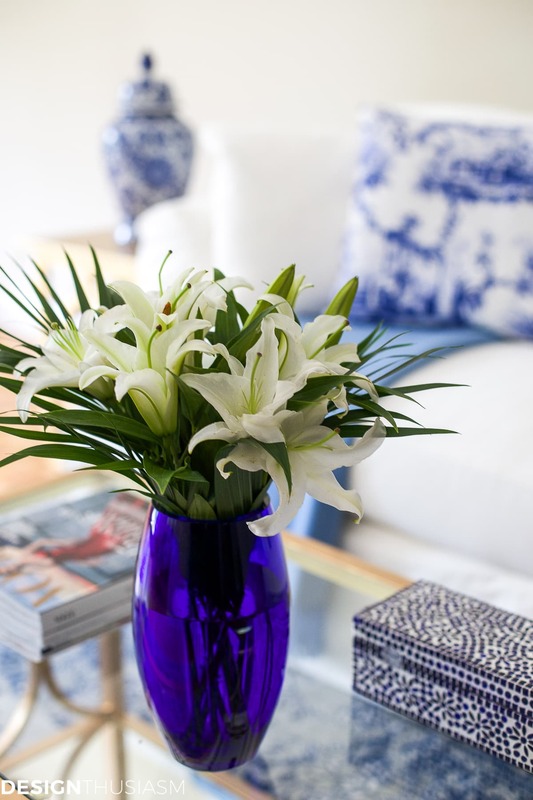 A pop of cobalt adds a touch of drama and contrasts so well against the white flowers. The space serves my parents perfectly. 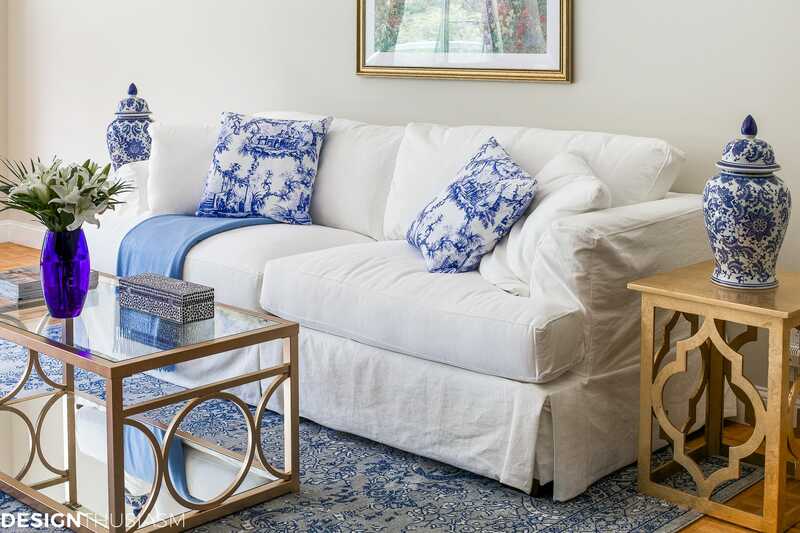 It’s comfortable and uncluttered and addresses their needs, yet still makes my mom feel at home when she sees her favorite blue and white decor. By maintaining her style, the move was less disorienting, and made it possible for them to downsize gracefully. Stay tuned next week for the bedroom reveal, as well as some details in the other rooms. And don’t let anyone tell you people in their 80s are too old to move! So great Lory….and I second that you can move elderly parents and they will love it. Love what you’ve created for them. What a classy couple! You did a beautiful job and the love shows with the details. I love the blue and white…who would guess your parents are in their 80’s with those moves….so sweet! Thank you so much, Cindy! What a lovely thing to say… ? I am fortunate that my mom lives with my brother and she has an entire floor to herself. Such a blessing. You are a great daughter to do this for them. They are adorable! How very sweet to include the video. I loved seeing your parents dance together. God bless them. Thanks, Alice! I’m do delighted that people enjoyed the video. I really thought twice about including it, but I’m very glad I did… ? A couple who still dances together is golden! Love what you’ve done with their new digs. You were very sensitive to their physical needs and everything is just lovely. 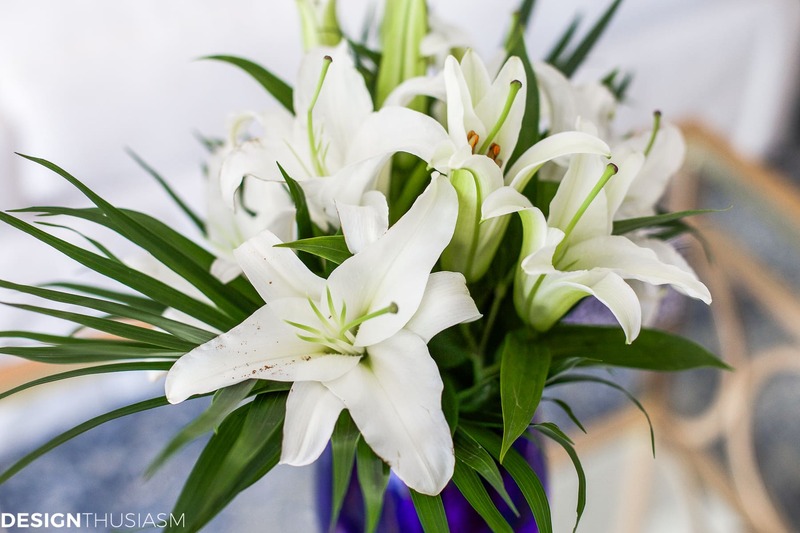 Thank you for sharing this beautiful blog. Seeing your parents dance was so touching. Everything was great and I especially like what you did to the coffee table! You are a good daughter. Thanks, Elizabeth!! And omg, yes, painting the coffee table in the middle of the chaos was quite funny. 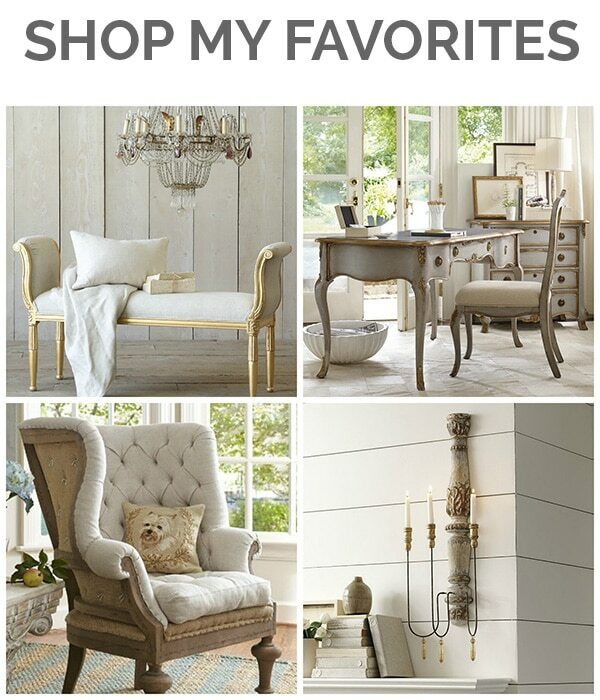 But I just couldn’t have them come with that brassy table in the middle of the room killing the whole look… ? Sooo wonderful to watch your parents dancing! They are so graceful and are clearly enjoying themselves. All the best to them! 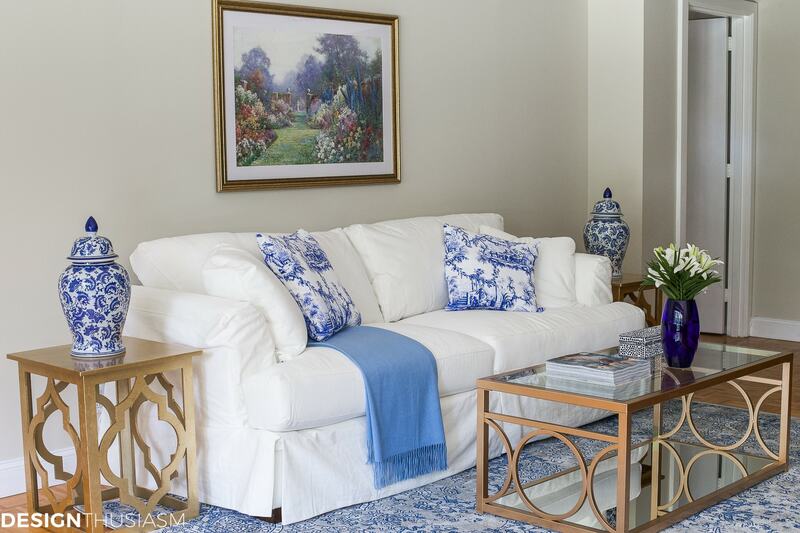 And their new home is just lovely–and my blue and white decor!!! Thanks, Gabi! Yes, they do enjoy dancing and they do enjoy blue and white!! This post and video made my day!!! Perhaps even made my week since we just went through Hurricane Irma! I’m a blue and white nut like your Mom. 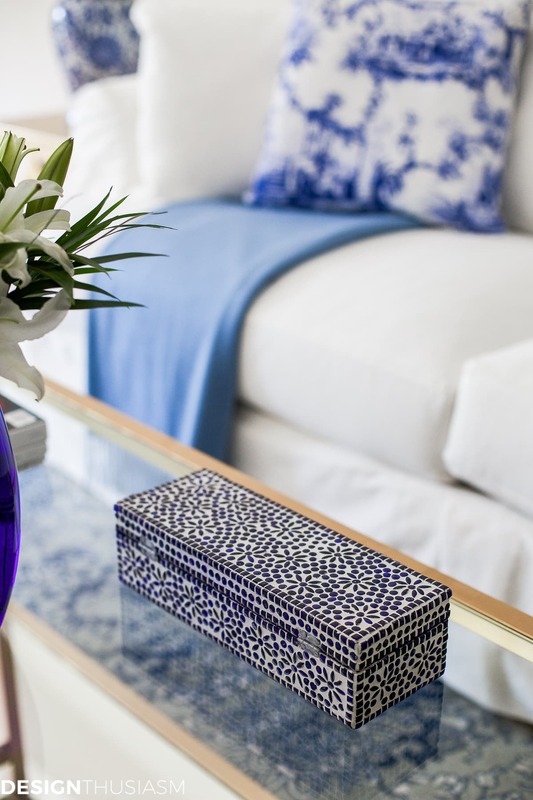 When we downsized to a rented townhouse I decided to decorate with my blue and white and store the rest. It has been such a peaceful place to live . Now, after Irma we are wondering if we even want to own again! It’s really been nice to let someone else bear the burden and expense of cleanup. I suspect that your parents will begin to realize the same thing. Job well done, sweet Daughter. Oh, Lory it’s gorgeous. You ARE a good daughter! They are so precious and I’m impressed with their moves to the Hispanic music. Do you have a little hot Latin blood in you, you minx? Thanks, Ginger!! And omg, my parents have been Latin dancers for years. When you go in their car and turn the radio on, you think you’re in South America because every station is Latin!! But no, as far as we no, no actual blood. Latin by choice!! Haha, thanks Kathy! But actually, it’s my dad who really wanted it and my mom who wasn’t sure about the downsizing and moving. She’s getting used to it and knows it’s better for them to be nearby, but I wouldn’t 100% say she was an easy sell… ? How sweet that your mom and dad are still dancing together with such definite and classy moves! Thanks for sharing their lovely new home and dance moves! Fantastic job, Lory! I know your parents must be thrilled and so very appreciative of all the love you put into making a beautiful new home for them. I love how you drew in all the blue elements to match the porcelains. 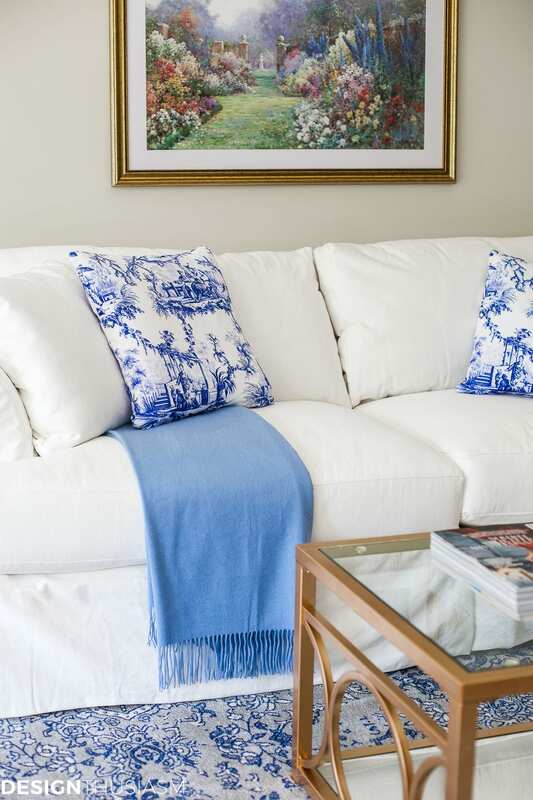 like the blue flowers in the artwork and the antiqued blue of the TV console. I was shocked at how reasonable the cost was for everything…looks far more expensive. You are such an incredible designer! What really topped off this post was your classy parents dancing…thanks for sharing this personal experience with us. My hubby’s parents are mid 80’s and ballroom dancers…they put everyone else in the family to shame when there is dancing involved at any party, lol! Hugs! Haha, thanks funny about your hubby’s parents, because it’s the same with mine. People tend to stop and watch them, even at an affair when everyone is dancing… 🙂 Thanks for the kind words too!! Yes, I tried to keep the prices low since they may want to eventually bring they furniture from their house and I didn’t want to be wasteful. Lory, what a lovely job of decorating you did for your precious parents. Everything is just so beautiful! They will really enjoy their new place. You are such a wonderful daughter to do all this for your dear parents. Bless you! Thanks for sharing the video of your parents dancing! This brought tears to my eyes! Lori you did a fabulous job with their transition. They are so cute and I can tell your mom is a fashion diva. I have always loved fashion, too and hope I can keep the spirit like your mom. I’m lucky that my mom is close by and already lives in a just right size one level home so no need to downsize. Thanks, Kim! Yes, it’s funny, but my mom dresses in skirt suits almost every day, even just to sit in the house. I can’t tell you how hard it was to get her to put the leggings on… lol!! Yes, you are lucky your mom os close by. I’m sure you already know the value of that since your dad is gone. It’s a very emotional stage. I loved the video of your parents dancing! You will cherish that for years to come. Ooo tears! Such love in that video! Thank you for sharing! Thanks, Deb! I’m so glad people actually took the time to watch the video… 🙂 I actually wasn’t sure people would be interested, but instead it evoked so many comments!! You will be so glad you got a video of both of them. Oh how I wished I could see my dad or hear his voice on a video. He’s been gone 6 years and I loved him with my whole being. Your parents are precious. My mom is now in Assisted Living so treasure this time. God bless you for loving them. Thanks, Lorraine, and you are so right. The video was actually taken by their caregiver and I was so grateful when she sent it… 🙂 I tend to be taking care of practical matters when I’m there, but will have to remember to take more video! I love it–they are very young 80’s and good for them! The blue really stands out and I can see the influence on your decor. I hope you will be putting more pictures on the walls. Very pretty. However it seems like it is set up for the look and doesnt seem very 80 year friendly to me. Thank you for your feedback! That’s an interesting comment, as this is their actual apartment. What aspect doesn’t seem 80-year friendly to you? The sofa is comfortable. There are pillows and a throw blanket. A nice big TV. Good lighting. Magazines that mom loves. A Bose dock for their music. An area of wood floor for them to dance (see video). What else do 80-somethings need? Really? What did you want to see? Rocking chairs and old afghans? Old chipped teapots? The space is delightful to look at and streamlined to promote safety. Everyone should be so lucky to have such a talented, devoted daughter who pulls her parents into her daily life. 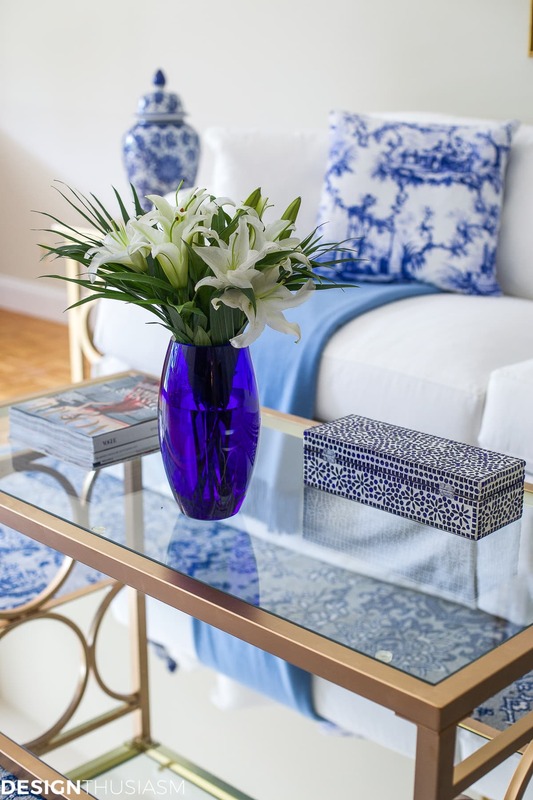 Love the blue and white in the apartment. My favorite was watching your parents dance, it brought made me cry and wishing my parents were still with us. Enjoy every minute with them. My parents used to go ballroom dancing, your video brought back happy memories. My father is no longer living and my mother turned 90 in January. Sadly she has dementia and is living in a care residence. I loved their new living room and I wondered what paint and colour you used on the coffee table and walls. Dennise. I wish you much peace! The wall color is Benjamin Moore Tapestry Beige which is the same color I used in my own house – pretty much everywhere. For the coffee table, I think I used Florentine Gold. It’s a metallic paint in a very small jar. I bought it at Michaels. I am the downsizer at 72 and am finding it very hard to declutter. We are selling a large house and building a smaller one. I have boxed up 5 generations of stuff into boxes and into 2 large moving van bodies to have a large sale. After doing this, I was ill and have not yet had the energy to have the sale. I pray that my house sells quickly and we can build the new one and get it decorated while we are still able. I have always loved to decorate and majored in design in college. I really want to do it myself and do not have a daughter who could help me. My only son will place things for me but does not love to decorate. You are such a good daughter to make a beautiful place for your parents. They are adorable. Thank you so much, Ruth! I wish you much luck!! We are currently in the process of selling and cleaning out my parents’ original home. As I work on this, I come back to my own home and think about decluttering all the time. I try to look at my things with the mindset of what it would be like for our kids to clean out our home. That helps make it crystal clear which things should be kept and which should be tossed. I try not to keep anything packed away in a box, because that means it will never be used. I do collect plenty of things, but if they will never be in the normal rotation of items I use and enjoy, those are the things I know to give away. Such a lovely room and a beautiful video to treasure!